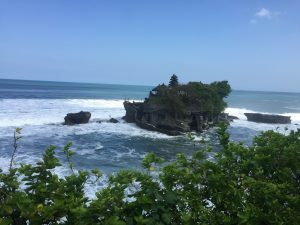 My last post ended with a cliffhanger, but after a brief hiatus, I am back to reveal the economic model and future plan for OneReef in Indonesia. After returning to Bali from the field I spent a majority of my time completing an activity report titled “Enhancing enforcement and building capacity in Dampier Strait, Raja Ampat, West Papua”. 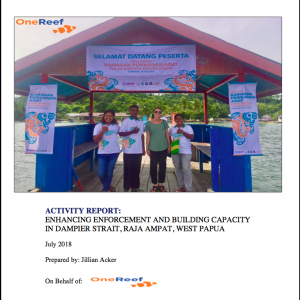 The completed report was shared with the team at OneReef, Rare Indonesia, and will be used for funding opportunities in the future. The field visit in conjunction with Rare in early July, 2018 provided valuable information in determining the gaps that exist in the current enforcement system, especially that pertaining to community-based patrol. The lack of community-based patrol is mainly due to the absence of a specified patrol boat, fuel, and compensation for village member time and resources. Although, community members did express interest in contributing to an informal community-based patrol system, one that would enable a fisher to simultaneously partake in fishing activities while observing illegal activity and violations to MPA regulations. The Yensawai village adat leader suggested that patrolling activity cost approximately 1 million rupiah per day of patrol, excluding a stipend for those involved in the patrol system. Additionally, it was suggested that it is more effective to supply those contributing to the patrol system “in-kind” with logistical items such as fuel and rice, rather than fresh money. This system will ensure an incentive to complete enforcement tasks in exchange for necessary logistical goods. Furthermore, the conservation agency in Waisai has committed to provide each village with 100L of fuel for patrol each month. The government assistance in the form of a fuel subsidy to complement infrastructure development from outside investors such OneReef will enable comminutes to patrol at least three times per week to fill the gap of the existing government patrol done by the conservation agency. Besides building a community-based patrol enforcement model, there is a secondary need in enhancing the fisheries supply chain in the Dampier Strait. The core zone, situated on the western side of Batanta Island is one of the more vulnerable areas of the MPA for illegal fishing due to the abundance of larger fish such as giant trevally. While fishing is not permitted within the designated core zone, fishers are allowed to fish directly outside of the core zone boundary. Village leaders from Yensawai, one of the closer villages to the core zone, claim that illegal fishers from Sorong often fish this area, causing major dispute over their territorial waters. The core zone is a KPA of all villages in Batanta Island, but because of the proximity to Yensawai it has been suggested by the adat leader that building a field station for fishers on land adjacent to the core zone is a practical solution to enhancing the fisheries supply chain. Establishing a field station will serve three purposes; first to allow buyers from Sorong to come directly to the field station to purchase fish, eliminating the need for fishers from Batanta Island to travel the long distance to sell in Sorong. This creates a more efficient, less timely, and less costly system. Second, this system will allow fishers to live on the undesignated land adjacent to the KPA to allow more time for fishing around the core zone and less time traveling to the zone, especially during high season which would result in a higher catch. Last, a field station would allow those based near the core zone to patrol the KPA of the core zone more frequently and efficiently. This concept is solely an idea, and while there is the potential for it to prove effective, many factors must be considered, such as the cost to capitalize the field station, the annual cost to maintain the field station, and logistics concerning who would patrol this area. To sum things up in simpler terms there is a need for funding, capacity building, and enforcement training, and these are the areas of focus that OneReef will work towards enhancing. The next steps for OneReef are to attend the 2018 Our Ocean Conference, which happens to be in Bali, and bring potential funders to the Dampier Strait Marine Protected Area to witness firsthand the state of the MPA and present the economic model. Overall my summer in Indonesia taught me a lot, and perhaps above all, I learned to practice patience, and not expect email replies in a timely manner. While I enjoyed my time in the coral triangle, I believe my summer abroad helped point me in a different path for my future. That future is still undetermined, but I think I’d like to stay away from the Ring of Fire for some time…three major earthquakes in three months was quite the send off. This entry was posted in 2018, Jillian Acker. Bookmark the permalink. 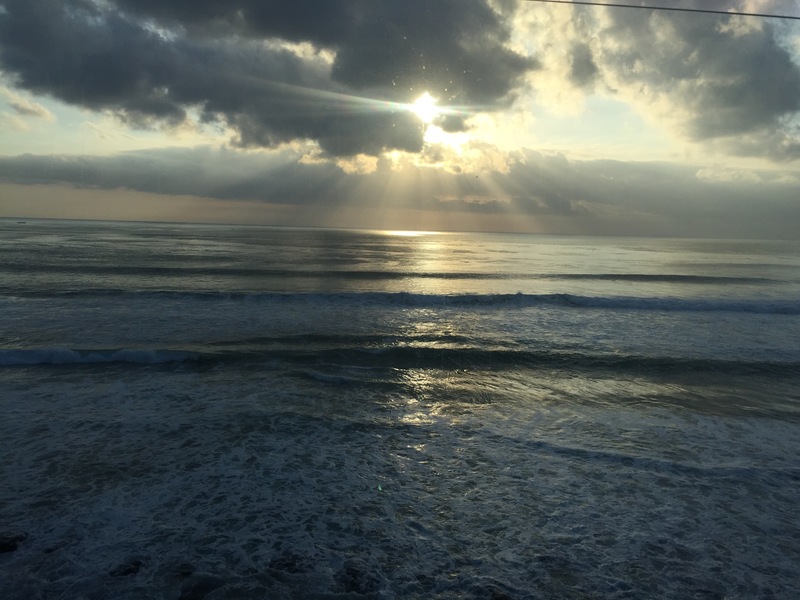 ← CBE Fellowship Reflections – From Monterey to Galway (IE) and Back.